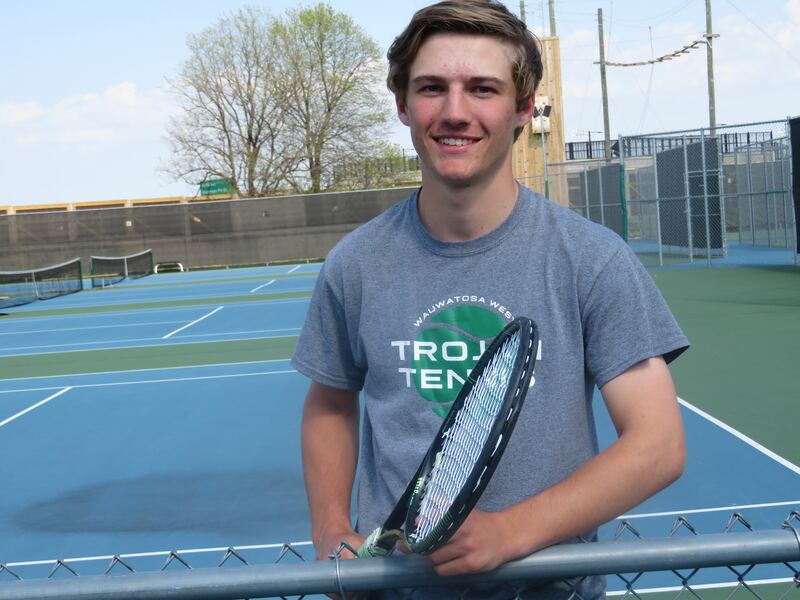 Wauwatosa West tennis coach Kosta Zervas doesn't hesitate to sum up how much senior Nick Price has meant to the Trojans program. "We don't get the players Brookfield gets," Zervas said. "A player like Nick comes around once in a coach's career, maybe twice. I'm proud of him. I'm proud of what he's done with our program. He's put a stamp on our program." We're more than lucky to have him. He is the best player I ever coached with our boys team. He's been a fantastic addition to our program. He will always be one of the best players I've had the opportunity to coach. That's pretty cool." Zervas was aware of Price long before he showed up at Tosa West. "I heard about Nick when I started coaching at Tosa," he said. "I heard of him through the grapevine. There was this boy who plays at Whitman. He's a pretty good player. He plays tournaments. He's got a lot of ability. "My expectations of Nick for our program was high. I didn't know what kind of player I was going to get, but I had high expectations." It didn't take Zervas long to realize Price was something special. "The first day of practice I saw him hit and I knew we had something special in Nick as a player. I was waiting for him to come to the program. We weren't as strong a team as we were now. "I think our players were waiting for that. We knew we had a bona fide No. 1 player. You see it all the time. You see it all over the state. A lot of freshman come in and they're top dog. It wasn't a big issue for me. I did it for Nicole Meyer, our girls player. So Nick came in his freshman year and just got better as the year went on." Price didn't disappoint Zervas with his performance, as he earned second-team all-conference honors, finishing with a 6-3 record and a second-place finish in the Woodland Tournaments his freshman season. "As a freshman I was with all juniors and seniors," Nick recalled. "I'm this small kid with a bunch of older, more experienced guys. But they knew where I was and were very supportive of me from the beginning on. But as Price improved, the pressure increased the last few years. "My freshman year no one knows much about you," he said. "But my sophomore and junior years people start to know you and you get more expectations. I felt a little pressure. "One thing about tennis, during matches you can take a lot of time in between changeovers. Oftentimes I would talk to my parents about staying positive. Talk to my teammates, just trying to keep it loose. You get support emotionally, not strategy-wise." Price looked back at his sophomore season and his first trip to the state tournament. "It was pretty awesome," he said. "It was great. I didn't expect much. My attitude was I had nothing to lose. I just wanted to play my hardest. My first win against Marquette was really excellent and one of the best matches I ever played." Price split two matches with Greater Metro Conference rival Marquette, beating Nick Yang (3-6, 7-5 (14) and losing to 8th-seeded John Massart (6-0, 6-0). His junior season he once again finished as the conference champion and earned first-team all-conference honors with a 9-0 record and made his second straight trip to state. Nick finished 1-1 at state, defeating Austin Sternbach of Kenosha Indian Trail (6-1, 6-1) and losing to third-seeded Ryan Risgaard of Neenah (6-2, 6-1), who finished third overall. This season he got injured in the conference finals and finished second, but finished with a 31-5 career conference record. He advanced to the subsectional (May 22) and sectional (May 24). State is June 1-3 in Madison. Like a lot of great athletes, Nick got started in his sport at a young age, playing at Highlander when he was 7 years old. "My mom wanted me to try a sport with my neighbor," he recalled. "I took some lessons, worked with a lot of professionals. I also did some summer programs for Brookfield Highlander. "I liked that it challenged me physically and mentally. And it's just fun. I had a lot of good friends who were playing it and those friends kept me engaged with it. I just love the challenge." 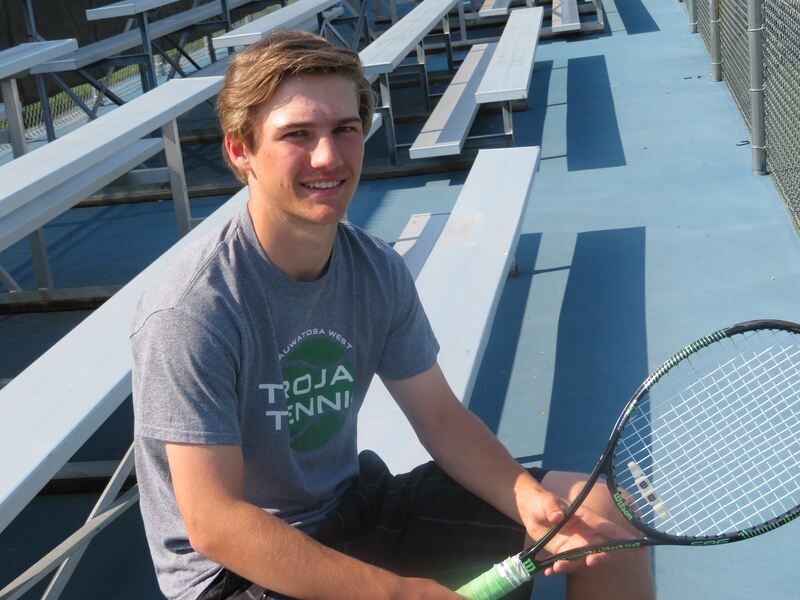 Although tennis is his major game, Price is a 3-sport athlete at Tosa West. He also played volleyball and baseball besides dominating on the tennis courts. "If you're committed to one sport you're kind of with the same people," Nick said. "Playing multiple sports, you're engaged with other people, enjoying something with those others. Having a commitment to one sport takes away from having the enjoyment you can have with other sports." Having played soccer and football in middle school, Nick switched to playing volleyball for the Trojans. "I didn't know I was going to play volleyball (in high school)," he said. I was considering soccer, but a lot of my friends were playing volleyball. So that was the reason I tried it - I wanted to try a new sport." Volleyball was a new challenge for Price. "I never played it. I had to completely learn it, get used to the sport," Nick said. "I played all over the place. started off as a center and worked my way to the libero. I played a bunch of different positions. I wasn't set on one thing. When I was on varsity and some of the experienced varsity players left, there were open spots." Price, who is 6-feet, 160 pounds, played all over the infield in baseball, but he was also a pitcher for the Trojans, a position he compared to tennis. "A lot of people don't like to pitch because you have to work through problems." he said. "I've always kind of liked that. You have to be mentally tough to pitch. I associate that with tennis as well. It's kind of where I get that. "You're basically out there (on the mound) by yourself. You have to think how am I going to get out of this situation. You have to basically stay positive the entire time." ​Price then talked about the turning point of his sophomore season in tennis. "I lost to Greendale three times and then I beat him," he said. "My confidence changed when I beat him. I became more aggressive. I just needed to figure out I needed to be more aggressive to win the matches. Zervas also felt it was a key point in Price's career. "I said I have a feeling about you today. This is your time. That was the turning point of his career. Maybe their senior underestimated Nick, but Nick beat him in straight sets. It wasn't even close." And that carried over to state. "I felt more relaxed going into my match," Nick recalled. "It was hard going in the first time, but it was easier my sophomore year. Before the match, I was more relaxed." Zervas felt that one of the areas that helps Price be successful, is he's coachable. "One of the things that stood out with Nick, I would speak with him and we'd some up with strategy and I wondered did he understand what I just said? We explained it and he applied it to his game. "I got a kick out of watching him do the things we asked him to do. A lot of kids want to do their own thing. But Nick did the things that we asked him. I'm asking him to hit the ball across court and you ask yourself 'Can they really do it?' and Nick can actually do it. He's very coachable. He listens, he's respectful, our players would see how hard he worked and they said 'Oh I have to work as hard as well.'" Both Zervas and his prize player agree on his strengths. "He's steady. He'll wear guys down," the veteran coach said. "Some players want points quick. Nick will grind it out with the best of them. His consistency and his patience will really push him through a match. "My defensive play is my key. Turning my defensive play into offensive play. Keeping the ball in play, being consistent, just wearing down opponents. Transitioning into offensive play." Price is the team captain and it is something he is proud of and takes an active part in his role. "You need someone to look up to and I want to be that person," he said. "I want to make sure that everyone's comfortable when they need help with a certain shot. I have a lot more experience than the players on my team. I've done a lot more off-season stuff than they have. So I have a little bit more match experience. So being able to have teammates who are comfortable coming up to me, it makes the team better when you have strong leadership." Nick recalled calling a team meeting this year after Tosa West lost to Greendale. "I thought it was important to have a team meeting and figure out what's wrong because obviously our goal was to win conference. We needed to turn things around. I was able to talk to each player and ask them what they thought - what went wrong. "I was comfortable talking to each player. I knew if I could get their opinion out everyone would be comfortable and fire up everyone as a team." Zervas talked about Nick's attitude toward the team. "He's a quiet kid, not very outspoken - but he leads by example. He's still playing with the guys, still goofing around with the guys," he said. "You'll find some real good players who won't go to practice. They might go and practice with their pro. But Nick stays with the team." When asked about goals this season, Nick, not surprisingly put the team first. "Winning conference was the biggest goal (West tied New Berlin Eisenhower for the West Division title with 5-1 marks)," he said. "As for me I would like to get to the round of 16 at state. That would mean beating a seeded player." FAVORITE MUSIC: Popular & Rap music. FAVORITE MOVIE: Star Wars Series. Action and Thriller movies. FAVORITE PLACE YOU VISITED: Mexico. WHAT DO YOU DO TO RELAX? Sleep or hang out with friends. MOST MEMORABLE SPORTS MOMENT: Beating Marquette opponent my first time at state my sophomore year. WHAT WOULD YOU LIKE TO DO IN THE FUTURE? Study business at the University of Wisconsin - Madison and play club tennis.